Henri Studio Hurricane Eye Water Feature promises an inspired outdoor garden fountain that has been hand finished by renown Henri sculptors. Hurricane Eye fountain creates a majestic focal centrepoint feature with it's unique Relic Lava distinguished finish. Water erupts from the main centre, whilst running water is separately pumped to the top tier, then swirls back down to the middle part into the eye of the Hurricane to stunning effect. 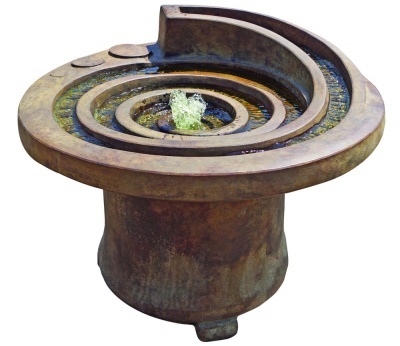 Authentic weathered finish gives the Hurricane Eye the appearance of an authentic antique fountain, constructed from genuine cast stone which is durable and weather resistant. Weighing 158kg the Hurricane Eye requires a fixed and well situated footing such as a patio position.